Nutritional status during pregnancy is one of the most important factors affecting foetal growth and development. Women are encouraged to follow a healthy, balanced diet during pregnancy. 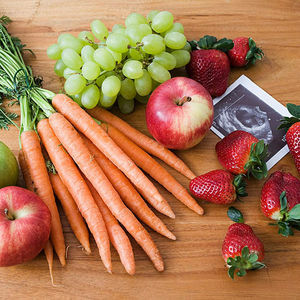 It is particularly important to consume fresh fruit and vegetables as many vitamin and mineral requirements are increased during pregnancy (especially calcium, iron, folate, vitamin C). NOTE: Foods containing iron are better absorbed if eaten with foods containing vitamin C.
It is recommended that women consume oily fish 2–3 times per week during pregnancy. Dietary sources of omega-3 fatty acids include salmon, pilchards, sardines, snoek, mackerel and anchovies. Fish with high levels of mercury, such as swordfish, shark and tilefish, should be avoided as mercury contamination has been associated with negative birth outcomes. Fish still remains an important part of the diet and should be not be excluded. It is recommended that pregnant women who do not eat fish take a fish oil supplement (speak to your dietitian or doctor). Other sources of omega-3 fatty acids include flaxseeds, chia seeds, walnuts, spinach and fortified products such as eggs. Women should ensure that they drink enough water during pregnancy: at least 9–10 glasses per day. This requirement is usually met through increased levels of thirst. Women who exercise should ensure that they remain hydrated and drink enough water during the day, as their fluid requirements may be higher. Women should remain active during their pregnancy. Exercise recommendations are similar to non-pregnant women: 30 minutes of activity 3-5 times per week. Types of physical activity recommended include walking, jogging, cycling or swimming. A safe level of alcohol during pregnancy has not been determined, therefore it is strongly advised that pregnant women refrain from drinking any alcohol. High amounts of alcohol have been associated with adverse effects such as foetal alcohol syndrome (FAS) which is associated with impaired mental development, inadequate growth and facial abnormalities. Eat a variety of foods to ensure a balanced intake. Introduce more fibre-rich foods into the diet, such as whole wheat breads and cereals (oats, oat bran, All Bran, Hi Fibre Bran, whole wheat Pronutro), beans and other legumes, and fruit and vegetables. Include more fresh fruits and vegetables into the diet, especially dark green leafy and orange-coloured vegetables. Drink at least 9–10 glasses of water per day. Cook all meat, fish and eggs completely before eating. Consume dairy products (milk, yoghurt, cheese) every day. Use only pasteurized milk, cheese and other milk products, as unpasteurized products may cause Listeria infection. Keep caffeine intake to less than 4 cups of coffee per day. Avoid the intake of alcohol. Follow good hygiene practices when working with food. Increase your fibre intake by including more whole grains, fruit, vegetables, oats, legumes, and bran. Brown JE, Isaacs JS, Krinke UB, Murtaugh MA, Sharbaugh C, Stang J, Wooldridge NH. Nutrition Through the Life Cycle. 3rd ed. Thomson Wadsworth; 2008. Should daily calorie intake be increased to facilitate healthy weight gain, and to what extent? Pregnant women tend to think that they should be eating for two. This is not necessarily the case, as the daily energy requirements of pregnant women tend to increase by an average of only 300kcal per day, which is equivalent to eating 2 slices of brown bread with peanut butter and a fruit. Therefore, by adding a healthy snack to their usual daily intake, pregnant women should be able to cover their increased requirements and gain the amount of weight recommended. We should bear in mind that pregnant women should listen to their appetite and not overeat just because they are pregnant. It is of utmost importance that pregnant women monitor their weight gain. If they are not picking up enough weight, picking up too much weight or if they are unsure if their current diet is adequate, they should consider visiting a dietitian.